Ilyse Dawicki, managing director of customs services, recently attended the Government Affairs Conference in Washington, D.C., representing Pilot Customs Brokerage. 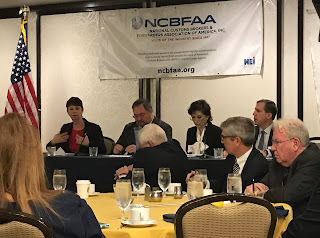 Ilyse, along with peers from the National Customs Brokers and Forwarders Association of America, lobbied for support of the issues facing the transportation industry. “We need our politicians to actively address the major concerns around protecting our importers and the security of the U.S.,” says Ilyse. In addition to gathering with members of Congress, the group met with Kevin McAleenan, acting commissioner of customs, and Brenda Smith, executive assistant commissioner, office of international trade.